Ninon Mix Labeling Machine is suitable for cylindrical products. Enabling users to apply up to three labels on products, Ninon Mix Labeling Machine comes with speed of up to 3,600 containers per hour. Offering positioning memory of 50 and 3 labeling stations, unit features labeling height settings through touchscreen controls. Suitable for cosmetics, chemical, paint, pharmaceutical, detergent, food and beverage applications, product can be integrated into exiting packaging line. CDA USA Inc. has added the Ninon Mix to its family of mixing and labeling products now being manufactured in its Richmond, Virginia facility. The Ninon Mix enables users to apply up to 3 labels on a wide range of product formats while insuring fast product format changeover. CDA has been manufacturing high quality semi-automatic and automatic labelers and fillers for over 25 years. The Richmond, VA facility offers manufacturing, customization, spare parts and demo machines. 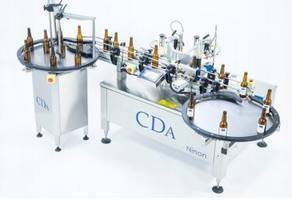 CDA filling and labeling machines have a wide audience in the Wine/Beer/Spirits, Food & Beverage, Cosmetics, Chemical, Paint, Pharmaceutical, Detergent and industries where products are bottled and labeled. Possibility of Evolution: The machines are easily adaptable since you can start with a basic labeling/filling machine and add-on parts later on (example: you can add-on a second label dispenser if you decide to add a back label to your product). Possibility of Integration: We can integrate our labeling and filling machines into your exiting bottling/packaging line. We Grow Together: Trade backs are available if you if you decide to upgrade for a larger version, we will trade you back your smaller machine. Our labeling and filling machines are user-friendly and last for a long time. You deal directly with a labeling specialist which has over 25 years of experience worldwide.